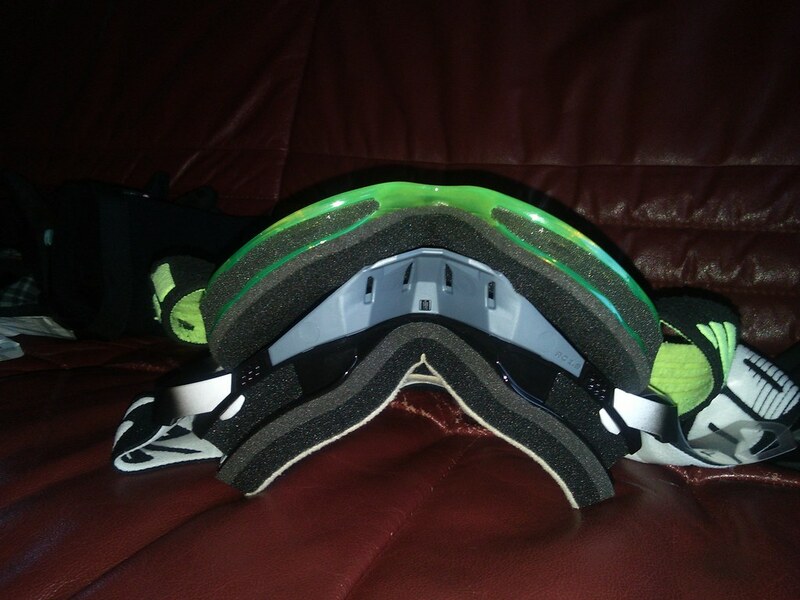 I have been using 2 pairs of these goggles for since winter 2016 to April 2018. 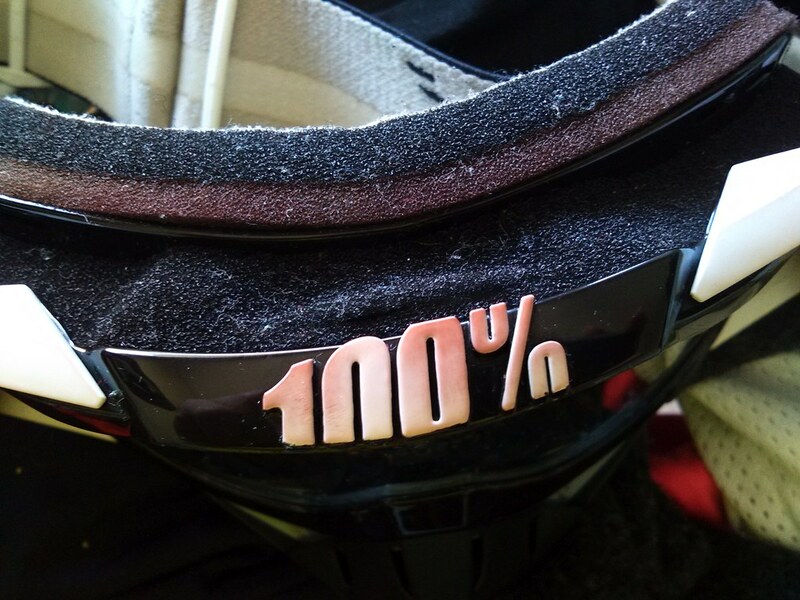 100% is a well-known brand in the motocross community & the past years more and more knowledge in the Mountain bike community.These goggles are made FullFace helmets like used in downhill and motocross. If you use the tear-offs, in rain or humid weather, there will be fog between the lens and the tear-off. So in rain or humid conditions, I don’t use the tear-offs because of this. does not obstruct the view, you might barely notice them, or not at all. 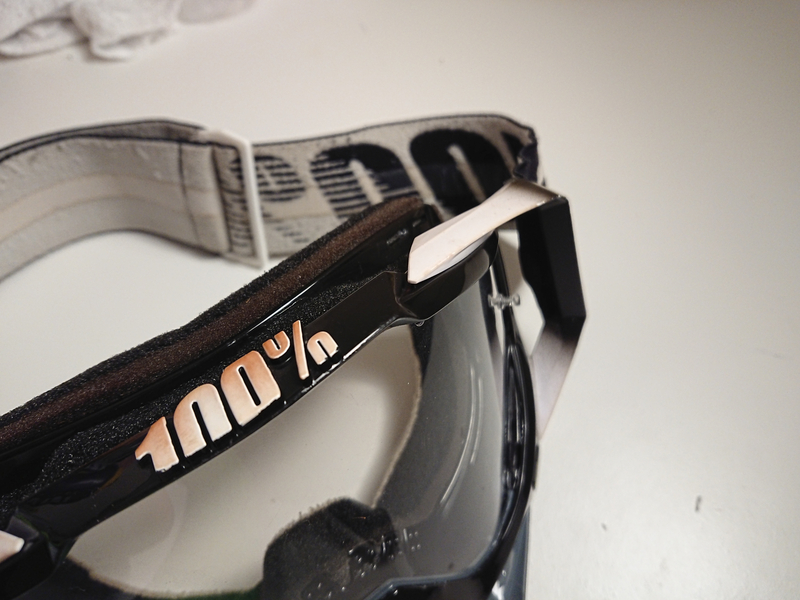 I think it’s easy to change lenses, but not too easy like with Adidas Pinner googles. It to change lenses in a hurry while out riding because they are so secured so well, but for me, this is this is not a con, you do not wave to worry about the lenses falling off. the triple layer foam & the vents make sure you don’t overheat and/or get soaked of sweat. The difference between the Adidas Pinner and 100% Racecraft is huge, soaked versus dry or almost dry to slightly moist foam in 25 Celsius, and soaked vs slight moist in not so hot days. But the sweat travels through to the Grey layer and if it’s much it can drip some. triple layer foam is a must for me. even after 4 weeks of summer riding the foam did not stink, this was done to test it, But I have been cleaning them at a regular basis, and swapping to fresh pair when the washed goggle was drying. The foam is well glued, and the durability of the foam is much better than the Adidas Pinner google has, none of the foam peeled off. the lens will stay on even if you are rough with the goggles. 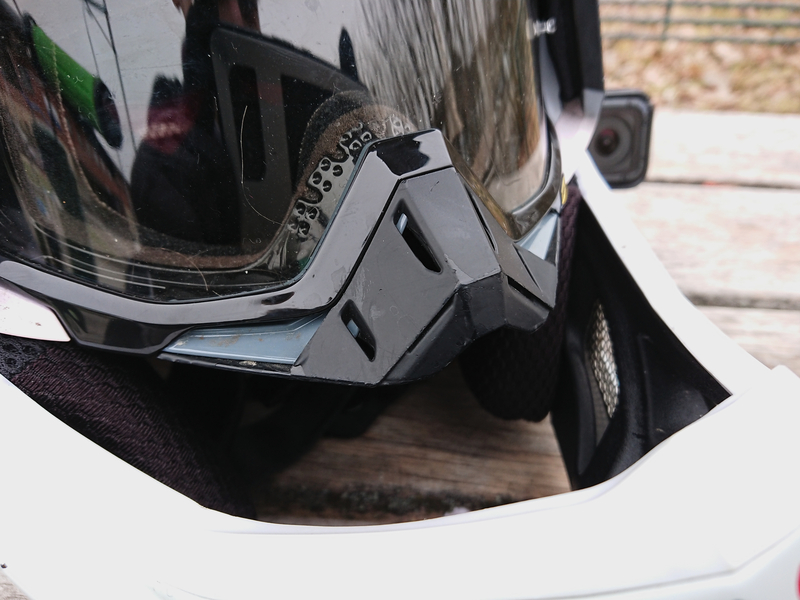 The rubberised strap works well, I use a 2015 Mavic notch & Fox Rampage Pro Carbon helmet, and it never slipped off. 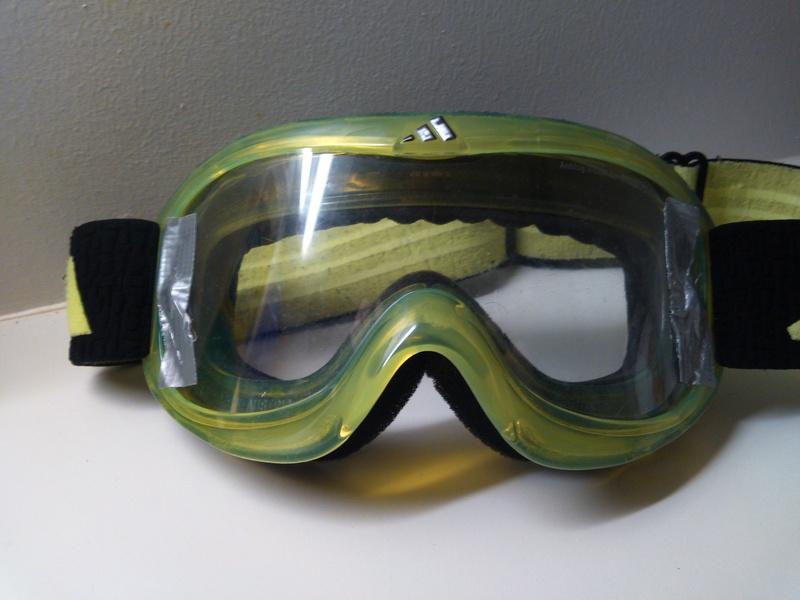 The tear-off system actually work, unlike on the Adidas Pinner goggles.,the plugs are the correct size, and the tear-fit tight so they won’t fall off. But I don’t use Tear-offs. 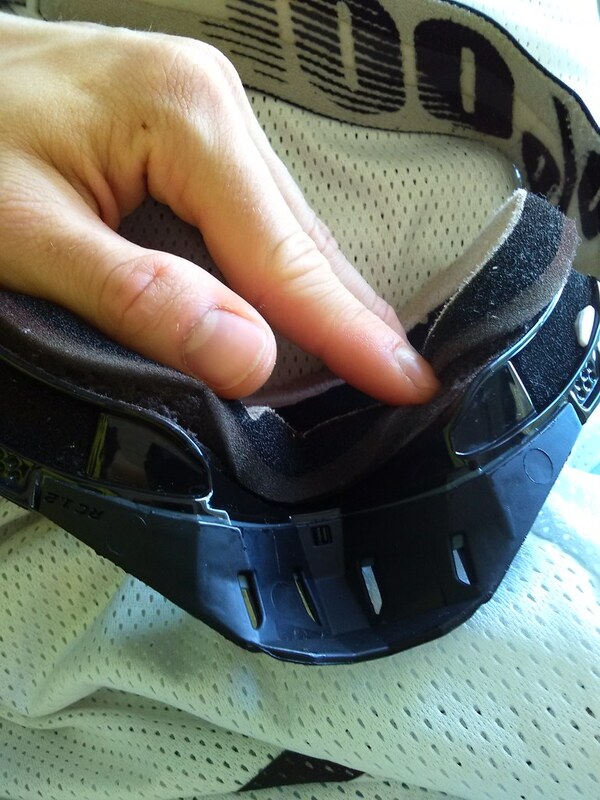 Nose guard, which is a must for me, I hit branches sometimes, which can be painful. the lens stays in place well. 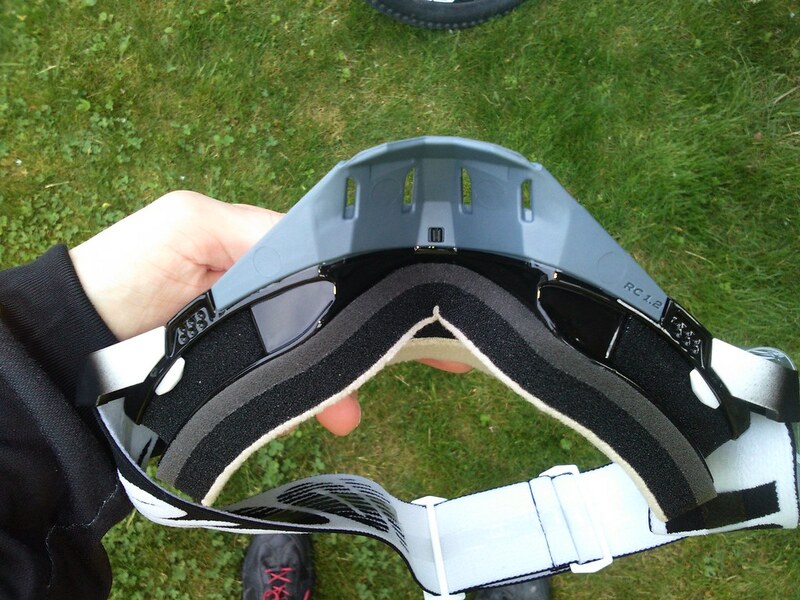 the perfect shape on the top which will not leave a big gap between the goggle and the helmet which some goggles do, Adidas Pinner for example. you can lose the nose guard without even noticing it, which I did with one of the goggles, mine probably snapped out when I took them off or a branch hit them, who knows. 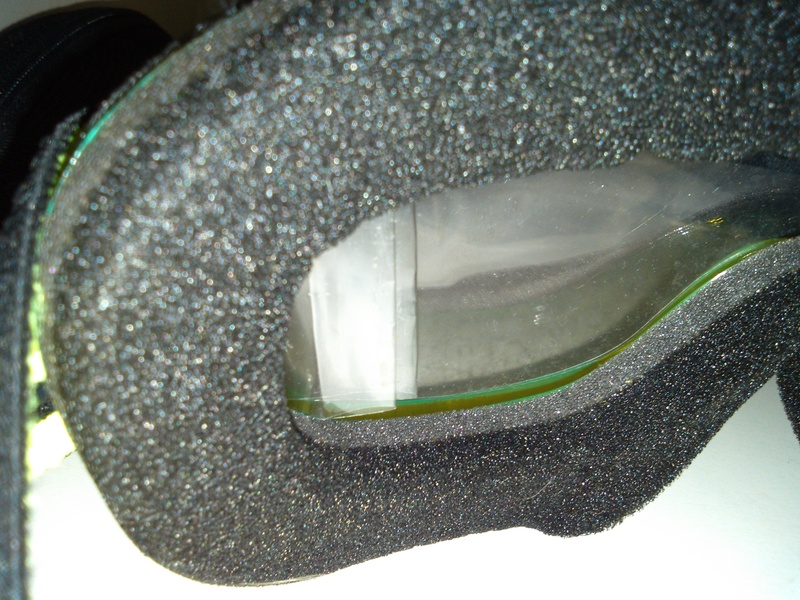 the extra lens got an anti-scratch sticker on it which needs to be removed, but one of the lenses that came with one of the 2 goggles I got left glue residue, so you should clean it off. The summer of 2017 the foam got a little bit torn, which is not surprising after so much use I put them trough. then some of the white parts have been discoloured, with a red tint, the same goes for the foam, why this happens I don’t know, it might be a reaction to sunlight or temperature, or something else, I am not sure. and the strap has been stretched by few cms. 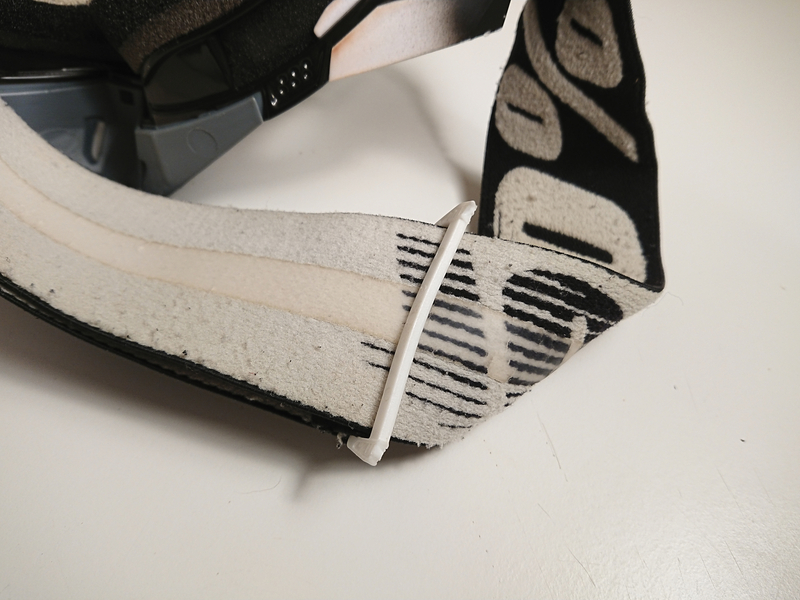 April 2018 the plastic part on one of the two goggles on the strap failed, this resulted in the stram loosening up, The difference in wear was probably due to me using one goggle more than the other, but both goggles had on the sticky strips, they had cracked, and did not grip as well as when the goggles were new. 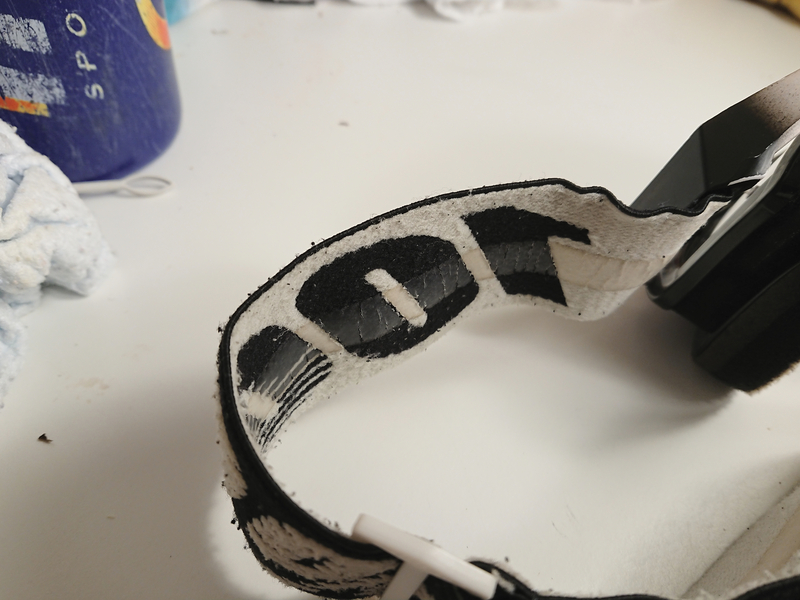 The strap arms were starting to separate from the goggle frame, which could be fixed with glue, but for me it’s easier to just buy new goggle instead of doing a DIY repair job, I am surer someone could do it. The nose guard I replaced also showed signs of wear, the paint was peeling off. This is a decent google, but It would be nice it had replaceable foam, but if you have the skills you can repair them with aftermarket foam, if needed, if the foam separates from the goggle, you can glue it together if you got the right glue. 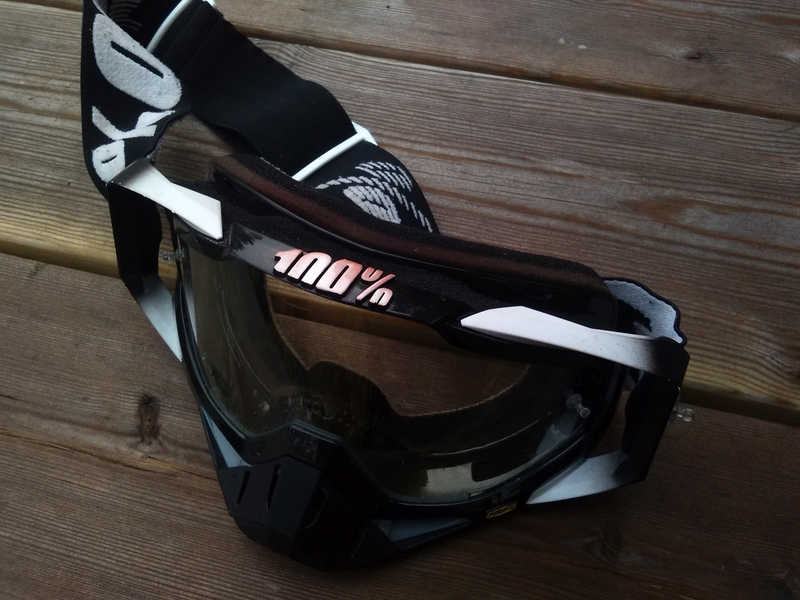 So far it is the best goggle I have seen to a decent price. The goggle offers excellent ventilation and comfort at a excellent price. 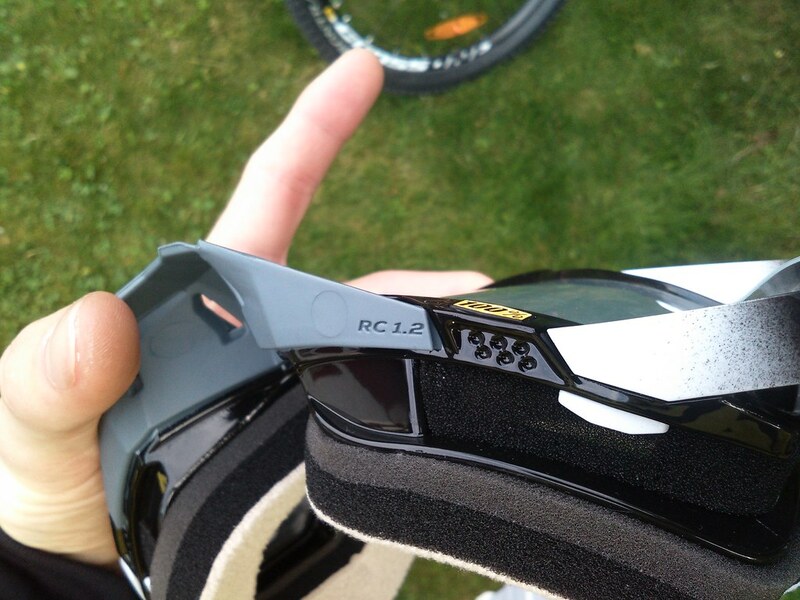 the lens protection system does not work as shown in this picture,you can see pro downhill riders using these goggles but never seen one with lens protection on.but sponsored riders got some spare goggles. The version with dots stays in place good grip in the band,the triple striped grip less. they are quite comfortable,the Nano-Foam is soft the plastic frame is flexing to fit the shape of your face. the tear off system does not work I tuck the plastic sense protector inside the gap where the head band goes, and bend it do not get in the way. lens protector’s hole part rip easily, so I taped it instead of using it as intended. Just after few weeks the show signs of wear. 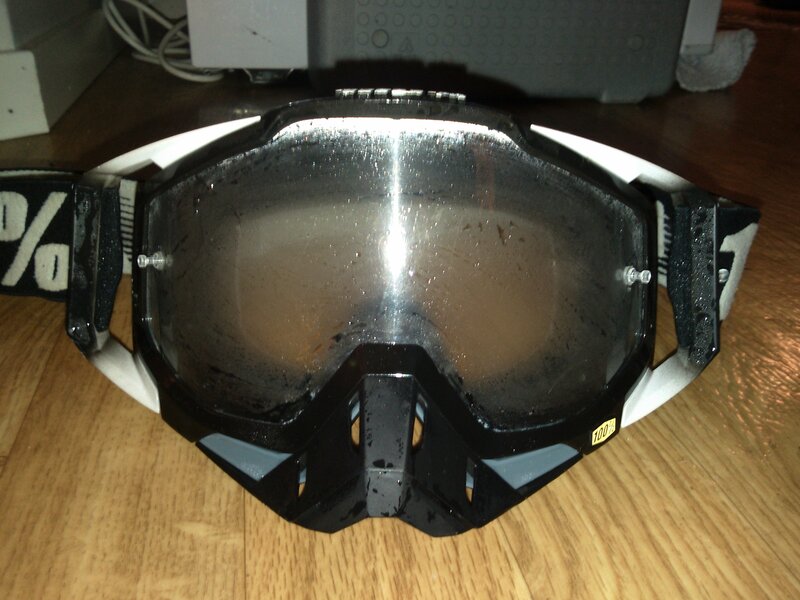 the Nano-Foam can easily tear apart, mine have issue with the section on my nose, and some on the sides the mesh loosened,but the foam fill wear off on every goggle on the market. some of the clear coat on the inside of the plastic glass fell off. I noticed it after cleaning the goggles,after months of use it got worse. 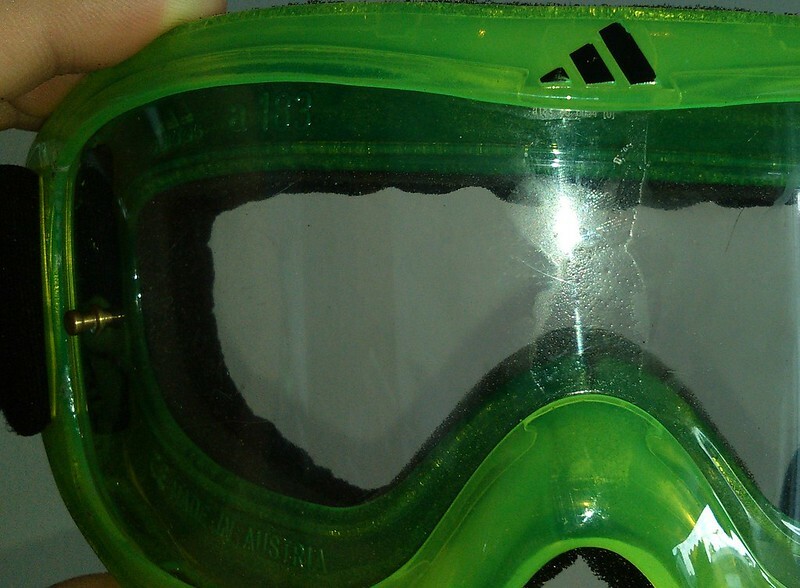 it would be nice with a solution that makes it possible to change the mesh with easy thing like if you need to replace the foam you need to order from Amazon or some where else where they sell foam for goggles, but Adidas and sport stores do not sell replacement foam,that wear out, if it does not you are not using the goggles. the elastic band stretched out on the triple stripe version, so I needed to tighten it more, on the tot version it did not. The triple striped grips crack. 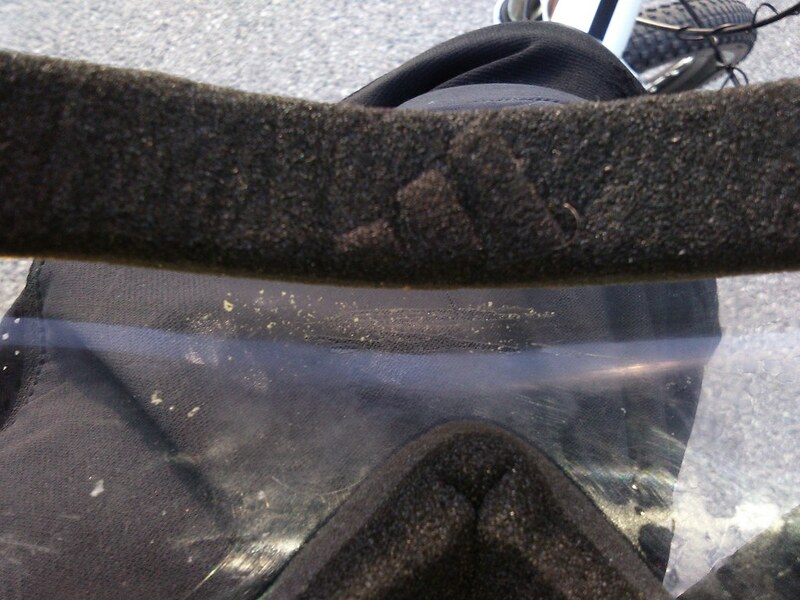 in hot days the foam will get soaked of sweat and the sweat splashes on the inside of the lens,which result in the goggle stinking after just 1 or 2 days of use. the coating do no lunger work, the fog up but i can’t wipe it off because it the damp is under the coating. 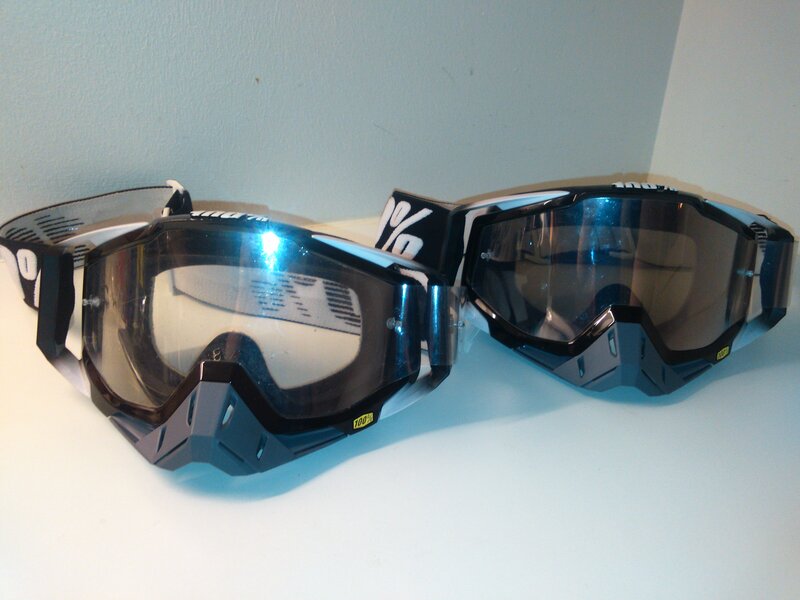 i have 2 goggles so i used them both 1 season and 1 winter and until now this summer. You might not notice but there is fog inside in the middle section of the lens. because of the lack of foam and venting which result in you getting soaked of sweat,and lack of durability and a lens that snaps out way too easily I can’t recommend this goggle.